Track and field’s elite circuit opened up its season with 12 world-leading marks in Doha, Qatar. 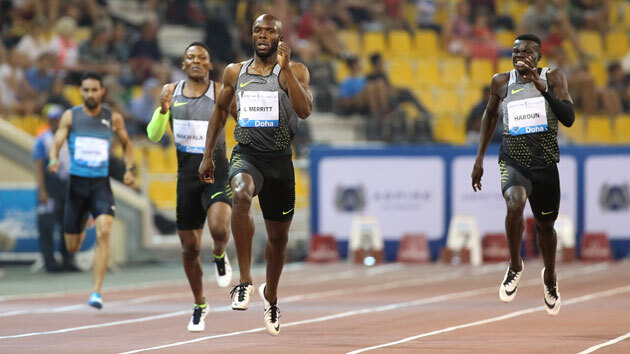 Track and field’s elite circuit opened up its season with 12 world-leading marks at the Diamond League meeting in Doha, Qatar. The United States was responsible for world-leading marks in the women’s pole vault, women’s 100, men’s triple jump and men’s high jump. Americans also added victories in the men’s 200 meters and women’s shot put. With less than three months to go to the Rio Olympics Opening Ceremonies on Aug. 5, athletes are wasting no time in rounding into championship form. Caster Semenya of South Africa won her first Diamond League meet since 2011 with her 1:58.26 victory in the 800 meters over a solid field that included 2013 world champion Eunice Sum of Kenya. In the final 100 meters, no one was catching Semenya as she moved from sixth to first in the final 300 meters. As previously mentioned in the meet preview and the 100 storylines to watch for Rio, Semenya will have a lot of eyes on her this summer. Last year, the Court of Arbitration for Sport suspended the “female hyperandrogenism” policy, which was adopted in 2011 by the International Association of Athletics Federations (track and field's governing body) and deemed high levels of natural testosterone as a competitive advantage. Semenya was subjected to gender testing in 2010 but went on to win silver medals at the 2011 world championships and 2012 Olympics. The 25-year-old Semenya’s win on Friday stamped her as the gold medal favorite for the Olympics. Now, get ready for the controversy to follow as we get closer to the Summer Games. Tori Bowie as a gold medal candidate? A bronze medal at last year’s world championships should not make this question much of a surprise, but it seems as though Jamaica’s Shelly Ann-Fraser Pryce and Dafne Schippers of the Netherlands have overshadowed American Tori Bowie. But on Friday Bowie ran a 10.80 (+.7 wind) to open her 100-meter campaign and upset Schippers. The 25-year-old former University of Southern Mississippi star matched her personal best from 2014 in Monaco, which was run in July. Her winning time in Doha was the fastest run this early in the year, so a personal best that could move her into the gold medal conversation for Rio is not out of the question. Schippers had a bad start that may have cost her the win on Friday. Fellow American LaShawn Merritt continued his hot streak to start the year with a 44.41 personal best in the 400 to take the victory over Trinidad and Tobago’s Machel Cedenio (44.68). Last season, Merritt ran five races under 44.50 and they all came after July. He has already pulled off the feat twice in the first two weeks of this season. Across the globe, 2015 world champion Wayde Van Niekerk ran 44.11 in Bloemfontein, South Africa, on Friday as well. Another American to note in the short sprints is a former Texas A&M star. Ameer Webb’s 19.85 victory could put him in the U.S. Olympic team picture. He handily defeated Isiah Young, who was a member of last year’s world championship team. Webb’s time is the second fastest of the year behind Merritt’s surprise personal best of 19.78 from last month. Merritt has said that he will not pursue the 200-400 double at the Olympics, so only Justin Gatlin may be in Webb’s way for the U.S. crown. Asbel Kiprop, the 2008 Olympic gold medalist at 1,500 meters, remains one of the favorites for gold in Rio as he took an easy victory in 3:32.15, comfortably waving to the crowd with 50 meters to go. He was on pace to run near 3:30 or 3:31 low before relaxing before the finish line. Fellow Kenyan Silas Kiplagat, who owns a 3:27.64 personal best, backed off the quick start and worked with a chase pack behind Kiprop and the rabbit. Kiplagat took third in 3:33.86 behind Elijah Manangoi’s 3:33.67. If pole vaulter Morris continues to win on the Diamond League stage, she will be one to watch at the Olympics. The world indoor silver medalist walked away from Friday’s meet with a personal best of 4.83 meters, the victory and a world-leading mark. The simplicity of the event is beautiful: An athlete jumps over a high bar and if it stays up, it’s good. Now factor in the fact that these men are jumping world-class heights that have come close to the height of a basketball rim in recent years. Sounds exciting? Now add quirky dances and interesting wardrobe choices and it’s even more fun to watch. Olympic silver medalist Erik Kynard of the U.S. took the win in 2.31 and stopped himself from attempting 2.35 as he cited being in a hard block of training. The Diamond League continues on May 14 from Shanghai, China.